The stock markets plunged last week and euro-zone bond market volatility increased with PIIGS yields spiking to new Euro highs as pressure mounts on the ECB to start printing money to monetize bankrupting PIIGS debt that effectively act as expanding debt black holes that threaten to swallow first the whole of the Eurozone and soon after collapse the worlds financial system. The pressure cooker reached a new extreme with the apparent shock of the FAILURE of a German Bund auction as the eurozone debt crisis contagion appeared to have spread to Germany as it experienced its worst bond auction since the launch of the Euro in failing to sell some 2/3rds of a routine auction which the mainstream press took as evidence of the flight of capital from the euro-zone accelerating on risks of announcements for a Euro-bond and the start of inevitable money printing of several trillions of euros as I have warned of several times over the year as being inevitable, where the longer the delay will result in more desperate actions. However the facts of the German bond auction failure are more to do with German greed than imminent euro-zone contagion, as Germany has sought to benefit from the internal flight of capital by offering its bonds at successfully lower interest rates culminating in the record low yield offering of just 1.98%, a rate which is in the face of 3% Inflation which the bond markets were just not able to stomach, so in reality it is a technical failure and nothing akin to that which has hit the PIIGS and lately spreading to hit France and Belgium. The Germans continue to resist out right money printing and implementation of Euro bonds because they know where it will lead to, i.e. lazy southern states that constantly spend far beyond their means (tax revenues) will put ever greater pressure on the ECB to print ever greater amounts of euros this resulting in ever higher annual inflation rates until the whole eurozone resembles what the likes of Greece, Italy and Spain were before they joined the Euro, i.e. basket case high inflation economies that rely on euro-zone core to finance government spending. The problem with euro-zone is that in its present form it is actually such a hard a currency when compared against the money printers such as the UK, US and Japan, that it is threatening to blow apart under the pressure of being too strict in terms of relative monetary policy. For instance the ECB purports to cleanse its bond purchase of PIIGS debt by selling other debt and assets, when it should be printing money to monetize the debt as other soft currencies are doing, i.e. acting to relieve the building pressure instead of being too hard and too strict the Euro-zone continues to be pushed towards the abyss because there is no real mechanism for dealing with the internal imbalances between the PIIGS and the likes of Germany the consequences of which are playing out in the euro-zone bond markets. The solution remains as I voiced near 2 years ago at the very start of the current phase of the inflation mega-trend which is that governments have no choice but to print money and monetize debt that will result in a decade long high inflation for ALL currency blocks (See January 2010 The Inflation Mega-trend Ebook (FREE DOWNLOAD), so regardless of where the Eurozone stands today it will also eventually end up as being a high inflation money printing debt monetizing economic block. The Eurozone crisis illustrates a key point that fails to register with many market commentators and that is that the right to print money by sovereign states is a major advantage, the lack of the ability to print money is a major flaw in the Euro that needs to be corrected which probably does mean implementation of a Euro Bond. Which is why US and UK debt yields are hitting record lows whilst Italy 10 year bonds are spiking above 7% against Britain with similar level of indebtedness currently stands at just 2.20%. which is because Britain can print as much money as it needs to, whilst Italy cannot print a single Euro! Therefore the Eurozone has effectively crippled all of the PIIGS and put them at a fundamental disadvantage compared to countries outside of the Eurozone - ALL to the advantage of Germany which gets record low interest rates AND a weak currency to feed its exports revenue generating machine. Remember that there is no solution that does not deal with the core problem which is that countries such as Greece continue to accumulate more debt whilst the economy contracts thus continues to maintain a large budget deficit which means debt to GDP continues to trend higher, and well above 100% towards 200% and bankruptcy. 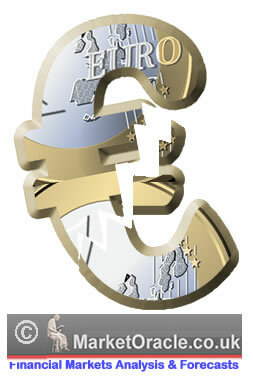 Structural flaws in the eurozone remain as I discussed well over a year ago in May 2010 (11 May 2010 - E.U. $1 Trillion Bailout, Detonates Nuclear Option of Printing Money to Monetize PIGS Debt) . Long before the mainstream press and BlogosFear that Germany is effectively bankrupting ALL of the eurozone because they cannot compete it, so my solution was and remains for Germany to leave the eurozone. The contagion is spreading from Greece that is consuming all of the other PIIGS, and lately Italy with France seeing its borrowing rates soar to their widest spread against German Bund's in a decade. ECB is putting pressure on Italy to adopt economic austerity, by holding off on buying bonds and pushing Italian yields back below 6%, last trade was at 7% after having spiked to 7.5%. The agreed fund of 440 billion Euros guaranteed on the back of Germany has already seen Euro 150 billion committed to Greece, Portugal and Ireland, with 106 billion committed to the support of the banking sector, leaving a balance of just 184 billion (of funds yet to materialise) which cannot cover Italy's Euro 1.4 trillion of debt, never mind Spain which combined would be looking at financing of at least Euro 400 billion per year. Therefore the Euro 1 trillion announced bailout fund without details now will need to materialise in detail as there already is a financing hole of at least Euro 216 billion for just Italy and Spain, never mind further support for the remaining PIIGS and the banking sector, collectively this would consume an approx 500 billion over just 2012, and probably a similar amount for 2013 therefore confirming my expectations for an ultimate bailout fund in the region of Euro 2-3 trillion to just stabilise the Euro-zone against the prospects of collapse of the Euro-zone banking system and thereby the whole world's banking system. Again the only solution is for the central banks to print money and monetize debt. That is what the ECB will do which will feed the euro-zones inflation mega-trend just as Britains money printing starting in March 2009 has fed the UK's inflation mega-trend pushing inflation indices to 20 year highs. With italian bonds yielding 7.22% fro 10 year, 7.65% 5 year and 7.28% for 2 year, it can be quite enticing for investors to contemplate buying at such deep discounts. However the problem is how confident can one be that these yields won't rise still higher to above 7.5%, especially as 6% was supposed to be have been the danger level and 7% the critical bailout level. The point is that financing costs of above 6% are not sustainable in terms of debt interest payments that risks triggering an exponential debt interest spiral that ensures ever higher yields all the way to default, just as has taken place with Greece and likely to take place with at least Portugal and Ireland. Therefore Italy is at that critical point where it has only a few months to get the yields lower before significant amount of debt starts to be sold at ever higher yields. In this respect Italy is seeking to finance approx Euro 25 billion during the remainder of 2011, with 2012 seeing a sizable Euro 350 billion of bonds marketed most of which will be during the first half of 2012, so Italy does not have a year or two to sort itself out it has perhaps three months at most and this is the risk that investors need to contemplate, in which respect I am not willing to put my own money on the line for this risk, i.e. that I would effectively be taking an approx 25% risk on capital against a potential return of 7%, plus a one off capital gain of 10% so 17.25% potential against a 25% risk (before tax, currency and inflation), against UK 2.25% where the effective risk is inflation as the UK is stealth defaulting by means of high inflation, so outright default is an extremely low probability. The problem is Italy should really be paying about 7-8% anyway IF it were outside of the eurozone and printing money resulting in high inflation. Therefore without the ability to print money Italy will default on its debts which means someone is going to have to print money and monetize Italy's debt, who ? the ECB is the only real candidate to do so, this will result in higher eurozone inflation, especially when France comes knocking on the ECB's bailout door. So far Germany has prevented the ECB from printing money proper along the lines if the UK and USA, how long will Germany hold out on money printing. My view as it has remained for approaching 3 years now and as illustrated in the conclusion of the Inflation Mega-tend ebook that all governments will print money to monetize debt which will result in decade long high inflation. My last analysis estimated money printing of Euro 2-3 trillion, which given the euro-zone debt dynamics remains as the likely amount to agree to at this point in time, though the longer the Eurozone delays in printing money and monetizing debt, then the debt crisis contagion will mean a higher eventual bill, for instance if the eurozone continues as it has done for the past year to delay and muddle through with half measures then the bailout money printing bill will have risen to more like 4 trillion euro's, so time is critical. As euro-zone core countries are consumed by the debt contagion black holes then so will countries such as Germany experience their own soaring interest rates, which will prompt Germany to panic and start money printing and monetize its own debt and thereby will be the trigger for huge Eurozone wide money printing inflation. Whilst the mainstream press focuses on the bankrupting PIIGS the rest of the bankrupting sovereign states outside of the eurozone continue to fly under the radar, as illustrated by smug politicians in the UK attempting to lecture Europe on how to solve its debt crisis. However as the following table illustrates the debt crisis is likely to come knocking on the doors of the UK and Japan sooner rather than later. UK and Japanese government bonds are grossly over valued and on the precipice of moves resulting in sharply higher interest rates (yields). The bottom line is that the UK Gilt has reached its safe haven status peak that is being artificially supported by the Bank of England money printing (electronically) to buy government bonds which is resulting in very high inflation, and because the bond markets are manipulated by artificial buying then this will have to ultimately have to play itself out in the currency markets which implies a sharply lower sterling exchange rate even against an exploding euro, though note that ALL currencies are in FREE FALL against one another, it all depends on the relative rate of free fall as measured by the real rates of inflation which for the UK is approx 7%. People of Britain sit up and take notice, the UK is in a far worse debt position than virtually every major western nation, whilst Italy is making the headlines today, then where the PIIGS are today the rest will eventually follow, that's the UK and Japan first and eventually France, Germany, US, ALL of these countries bond markets are trading at or near record low interest rates. This gives investors a series of opportunities of the decade to profit from the inevitable by shorting bonds of first the UK, then Japan, France, Germany and finally the United States, which given the debt mountains the magnitude of profit potential is likely to be huge, nearly as large as for those that shorted Greek bonds 2 years ago. In terms of the sequence of which bond market is likely to explode sooner rather than later, then I would rank the UK and Japan as the prime candidates to join their PIIGS brethren with soaring interest rates and collapsing bond markets, this collapse in market confidence and prices will likely take place within a matter of weeks that could be triggered at any time by ironically good news out of the euro-zone as that would switch the global bond markets attention to the fact that the UK and Japan are just as bankrupt as any of the PIIGS, and as we have seen with the PIIGS, a sequence of financial shockwave's could result in a collapse of the Coalition Government. This is not idle speculation but a trend that is in motion which I will expand upon in my next in-depth analysis as to its consequences. If you recognise the fact that the primary economic lever at disposal of governments and central banks is INFLATION, then you will begin to understand how the global economic system really works and not as vested interest academics want to model of how it should work. 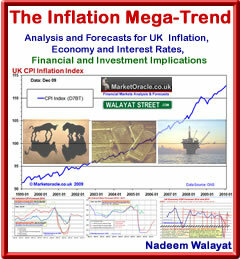 The bottom line is that Governments NEED inflation. They need inflation to BUY votes, they do this by printing money or debt. There are a multitude of mechanisms that governments employ to print money from the fractional reserve banking system creating credit, to governments printing debt, to governments printing electronic money to monetize their debt, to governments printing bank notes. This debt be it banking sector, private or government is devalued by INFLATION, the higher the the inflation the more votes governments can buy. What cash obsessed deflationistas' FAIL to understand is that the governments will not allow deflation to take place, they can and WILL FORCE YOU TO SPEND YOUR SAVINGS, How ? By using INFLATION. They will PUSH inflation ever higher until you SPEND YOUR EARNINGS, LIQUIDATE YOUR SAVINGS, else you will LOSE ALL OF YOUR HARD EARNED WEALTH. This is the exact experience for those in the UK, where after tax even on the official CPI that is at least 2% below real inflation, UK savers are losing approx 3% per annum of the value of their savings. How long are you going to save for if you are losing 3-5% of the value of your savings. Your going to move your cash out of deposits and into capital investments or consumption, this is called increasing the velocity of money, it's just that governments love inflation so much that they get carried away and inflation runs far ahead of anything that anyone ever imagined it would be. So whilst volatility in the stock market may be high, I know that in the long-run my portfolio of dividend increasing stocks will HEDGE me against the Inflation Mega-trend. The current eurozone debt crisis is as a consequence of the inability of the bankrupting PIIGS to print money, something they gave up because they wanted a stable currency instead of a currency that is destined to wipe out all savings every 10 years. So these stealth defaulting states did make the right decision for joining the Euro, but the error is in the design of the euro-zone for it is not a properly functioning currency because it does not allow for stealth default for bankrupt states by virtue of the German fear of hyperinflation instead it is designed to be ANTI INFLATION MEGA-TREND for as long as Germany does not economically suffer, for if Germany suffers then Inflation is back on the menu! but as I explained earlier the worlds financial system is designed to be inflationary, this means that either the ECB PRINTS MONEY and monetize's debts and therefore feeds the Eurozone inflation mega-trend OR the PIIGS default on their debts AND STAY in the Euro so as to replicate aspects of the Inflation Megatrend boom bust business cycle, though with far greater monetary stability than the PIIGS usually experience because of their German fiat currency anchor. This is what those in charge of the Eurozone need to recognise and implement, i.e. mechanisms for periodic orderly defaults of states in line with the business cycle, which is the ultimate solution to the crisis's that I expect and which supports my ongoing analysis that Greece will default on its debts AND stay within in the Eurozone. The best solution for the debt crisis is for bankrupt countries to have a short-sharp shock to default on total debt, get the economic contraction out of the way,shrink the public sector and then out of the pain implement sound government spending policies which will ignite the next economic boom. Why economic boom when every one is obsessing over economic collapse ? Because the markets DISCOUNT THE FUTURE, the panic plunge of asset prices as a consequence of the debt default and economic contraction will present investors with buying opportunities of the decade! As investment floods in, especially when the the Euro with Germany behind is relatively stable, compared to what would happen to the likes of the Drachma, and Lira, which means cheap assets, no debt, small public sector, low wages and relatively stable inflation, what more could investors ask for? Therefore the economy then booms, and a few years down the road governments again start to increase spending and the size of the public sector as governments borrowing once more goes out of control and the economy goes bust, and so repeats the boom bust cycle, however in the meantime investors and workers profit and prosper. So don't write off the bankrupting PIIGS for if they do have their debt cleansed, and shrink their public sector and wages to a competitive level then watch their economies BOOM for MANY YEARS! (depending on the competency of their governments to not mess things up, as not all countries governments have shown themselves to be equally competent, for instance Ireland and Spain appear to be more competent than Greece and Italy which has been in a growth recession for nearly as long as Japan as a consequence of NOT defaulting on its debts many years ago). Meanwhile take note of my preceding articles warning to protect your deposits, not because I think that the euro-zone will collapse, but because the risk of collapse is NOT ZERO, therefore the risk of loss of funds deposited in any UK bank is NOT ZERO, as once the euro-zone collapses it will likely take the whole global financial system down with it, so you need to protect your deposits by ensuring you are within the FSCS limit of £85k per banking licence group. Whilst actual loss of funds is a very low probability, what is more probable during an unfolding crisis is that deposits in Euro-zone banks are frozen, therefore I would be reluctant to hold any funds in a euro-zone linked bank no matter how much propaganda is pumped to pretend that their UK arm is separate and in no way connected to their group head office in for instance in Spain, as after accounts are frozen it will be too late to wish you had acted when you had the chance to do so.... more steps on protecting your deposits - Savers Protect Your Deposits From Bankrupting Banks and Quantitative Inflation. I still stand by my long standing conclusion that Germany will leave the Eurozone and the Eurozone will print trillions to prevent a banking system collapse, both of these outcomes will feed the Inflation mega-trend. More on the Inflation Mega-trend in my next newsletter, ensure you are subscribed to my always FREE Newsletter to get this in depth analysis in your email in box. Your UK Bond market shorting, pulling funds out of euro-zone banks analyst.